Peaks: The set of peaks for transcription factors, histone modifications and variants that are part of our regulatory resources. In previous releases these used to be collated in one file, called ‘AnnotatedFeatures.gff.gz’, but with our recent expansion to 88 human cell types with ChIP-seq data, the file became too big. Therefore, we split it into separate files by cell and feature type in the ‘Peaks’ subdirectory. The peaks are now available in gff, bed and bigBed format. the enrichment of the ChIP over the Input using CHANCE. Regulatory build: The current set of regulatory features along with their predicted activity in every cell type. We provide one gff file per cell type in the ‘regulatory_features’ subdirectory. Transcription factor motifs: The transcription factor motifs identified using position weight matrices from JASPAR in enriched regions identified by our ChIP-seq analysis pipeline in gff format. Ensembl genomes 33 is out! 28th October 2016 by Ben (Outreach)·Comments Off on Ensembl genomes 33 is out! Updated peptide comparative genomics for Plants and Fungi. Updated BioMarts for Plants and Fungi. Updated protein features from InterPro for Plants, Metazoa, Protists and Fungi. Ensembl 86 has been released! In Ensembl 86, you will now be able to view the annotated genome assemblies, variation data and comparative analyses of 16 different mouse strains, produced by the Mouse Genomes Project. While the GRCm38 assembly (produced from Mus musculus strain C57BL/6J) remains the reference assembly, variants and comparative analyses for the other strains can be viewed through the Gene tab and the Location tab. You can find the gene trees and orthologue/paralogue predictions for the mouse strains through the Strains option in the menu in the Gene tab. The mouse strain gene tree depicts the evolutionary history of genes (left) and protein alignment (right) for the individual mouse strains and rat. You can find the variants between these mouse strains through the Strain table option in the menu in the Location tab. The strain table displays the alleles identified at variant positions across the 16 mouse strains. In Ensembl 86, LincRNA data will also be available for the anole lizard, flycatcher and cave fish. 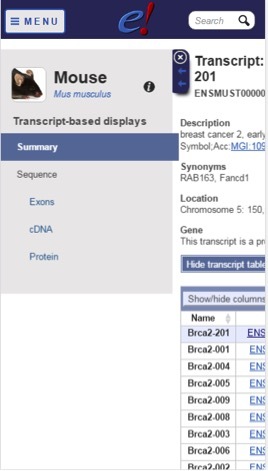 As of release 86, you can now view transcripts on the mobile version of Ensembl. 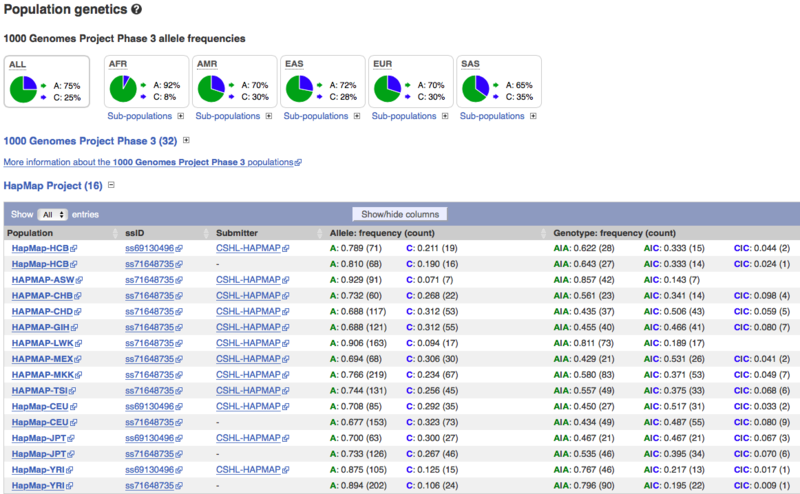 You can also view exon sequence, cDNA sequence and protein sequence by clicking on the lefthand arrow. The gene sequence is also now available to view on mobile devices. 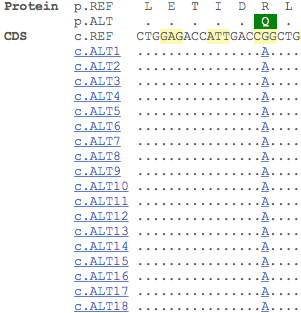 Just go to any gene page and click on the left hand arrow and then choose sequence. Find out more about the new release and ask the team questions, in our free webinar: Tuesday 11th October, 4pm BST. Register here. Annotated genome assemblies, variation data and comparative analyses of 16 different mouse strains will be included in Ensembl 86. LincRNA data will be available for the anole lizard, flycatcher and cave fish. Dataslicer tool- This tool allows you to get a subset of data from a BAM or VCF file. Variation pattern finder tool- This tool allows you to identify variation patterns in a chromosomal region of interest for different individuals. Forge analysis tool- This tool takes a list of variants and analyses their enrichment in functional regions from the ENCODE or Roadmap Epigenome project on a tissue specific basis. NCBI have recently released plans to immediately retire their HapMap interface, however, data from the HapMap Project will continue to be freely accessible through Ensembl. There is lots of help and documentation as well as video tutorials to help you learn how to access variant data in Ensembl. This post aims to complement those materials to highlight the methods for accessing the HapMap Project variant data specifically. 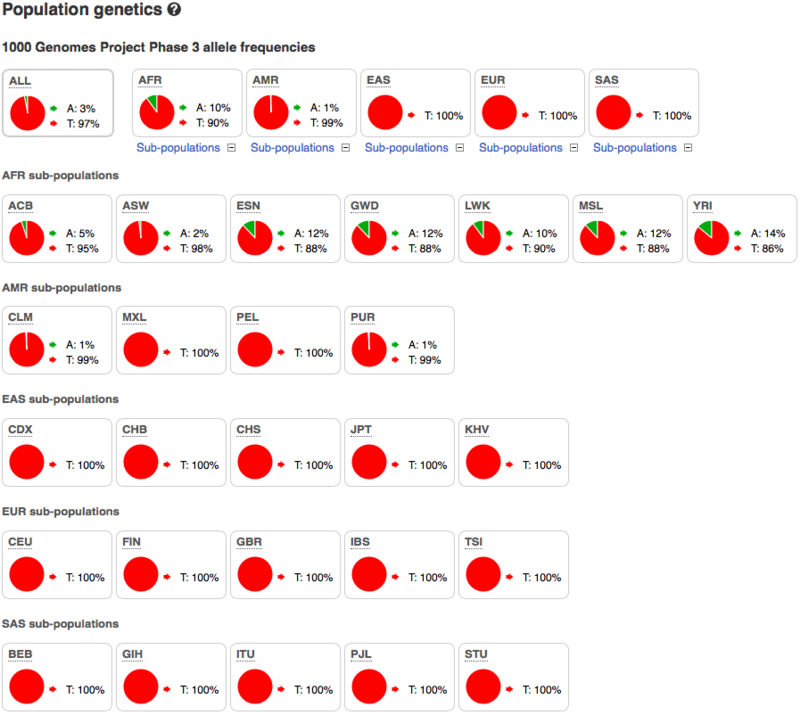 However, as you can see from the example above, some of the populations represented in the HapMap Project have two separate entries in the Population Genetics table. This is because the HapMap Project was completed in a number of phases. In the first phase, a number of different groups used different genotyping platforms to type variants from a number of population panels (CEU, YRI, HCB, JPT). In a later phase, a larger set of samples were added to the samples from the initial phase and submitted as HapMap3. The two entries refer to the two submitted phases of the HapMap Project, where the number in brackets next to the allele frequency indicates the number of samples in that population. It is also possible to view HapMap Project results by gene of interest by searching the Variant Table. The Variant Table can be filtered by ‘Evidence’ type so you can choose to see only HapMap Project variants, for example. Filtering the Variant Table by ‘Evidence type = HapMap’ will filter the displayed variants to those identified in the HapMap project. This will be denoted by the in the Evidence column. HapMap SNP data can also be retrieved using BioMart. There is help and documentation and a video tutorial to help you while using BioMart. 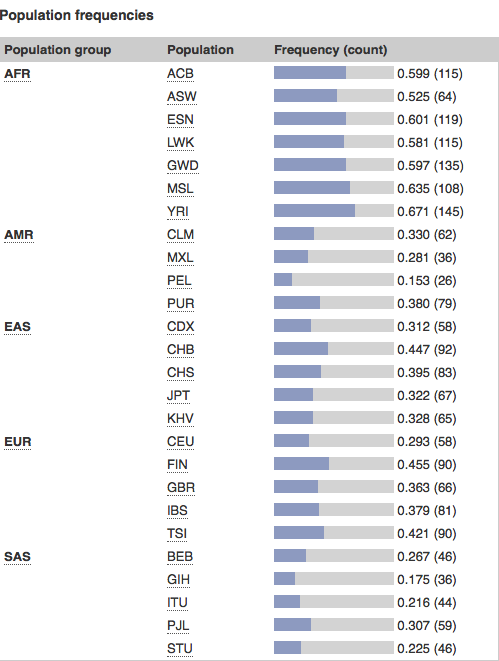 When querying the Homo sapiens short variants dataset in BioMart, you can access HapMap variant data specifically by using the ‘Variant Set Name’ filter and selecting the HapMap populations that are relevant for your research. It is also possible to access variation data through the Ensembl APIs. Using the Perl API, for example, it is possible to retrieve variation data specifically related to the HapMap Project variant set, either as the whole HapMap variant set, or as individual populations represented in the HapMap Project. A mysteriously common debilitating genetic disorder. A deadly tropical disease. One of my favourite stories in the history of genetics weaves together these two elements – it’s a good one and it always deserves a re-telling – that of malaria and sickle cell anaemia. This story captures my attention and inspires me in the power of scientific observation, curiosity and experiment. I’m sure you are all aware of the details of this worn-out tale: it is used as an example in classrooms and lecture theatres every year to explain Mendelian genetics, haploinsufficiency, physiology, disease and protein structure and function to young scientists. To mark the coincidental coinciding of DNA day and Malaria day, we wanted to re-visit this ‘historical’ example of how scientific observation and experimental approaches have led to the understanding of how a disease as debilitating as sickle cell anaemia paradoxically persists in the human population. Molecular biology and bioinformatics have transformed the face of biological research over the last few decades. The speed that scientists can sequence and analyse DNA means that global collaborations that study thousands of individuals are beginning to shed light on a range of different diseases. Sickle-cell anaemia is a disease in which red blood cells form an abnormal crescent (or sickle) shape. It is an inherited disorder, and was the first ever to be attributed to a specific genetic variant (rs334, see it here in Ensembl). In 1949, ‘Sickle Cell Anaemia, a Molecular Disease’, from Pauling et al. identified a difference in the electrophoretic mobility between haemoglobin from healthy individuals and those with sickle-cell anaemia caused by a change in molecular structure of haemoglobin responsible for the sickling process . The genetic variant (A, Reference:T) that causes cell sickling results in the substitution of a conserved glutamic acid residue at position 7 in beta chain of haemoglobin to a valine . You can find this information in the Genes and regulation section for this variant. In the table below, which has been filtered to see only missense variants, the ‘Allele (transcript allele)’ column describes the variant allele (A) and the transcript allele (T, as the HBB gene is located on the reverse strand). You can also see the nature and location of the variant on the transcript in the ‘Position’, ‘Amino acid’ and ‘Codons’ columns. The SIFT and Polyphen algorithms predict the effect of the amino acid change on protein structure and function. Interestingly, only the SIFT algorithm predicts that the T/A variant would have deleterious effect on haemoglobin structure and function, confirming that predictions can never be as accurate as experimental evidence. Only those individuals that are homozygous for the variant allele develop sickle cell anaemia, although heterozygous individuals do have the much more manageable sickle cell trait. If untreated, individuals with sickle cell anaemia have a shorter than normal life expectancy, experiencing lethargy and breathlessness throughout their lives, with increased risk of stroke and pulmonary hypertension, as well as increased vulnerability to infection. Individuals with the milder sickle cell trait can experience problems in low oxygen or as a result of severe physical exercise, but can mostly be expected to live normal lives. As such it would be expected that this variant would be rare in human populations. However, observations made in mid-20th century revealed that this variant is, in fact, surprisingly common in African, African American and Caribbean populations (you can see this in the 1000 Genomes allele frequencies available under Population genetics in Ensembl). Coincidentally, these were people descended from those who came from areas where malaria is prevalent . Why was this happening? Individuals carrying just one copy of the variant allele were known not to develop sickle cell anaemia, leading rather normal lives. However, it was found that these same individuals, were in fact highly protected against malaria. It turned out that, quite bizarrely, having alternate alleles at this loci simultaneously prevented infection from the malaria parasite with entirely manageable sickle manifestations! Therefore, individuals with one copy of each allele have a greater chance of survival in geographical areas where malaria is endemic, preserving both alleles in the population. Understanding this relationship has led to a deeper understanding of the infective lifecycle of the malaria parasite and novel approaches in combating malaria [4-5], but also an appreciation of the genetic factors leading to sickle-cell anaemia. This story exemplifies how observation, epidemiology and scientific investigation can uncover the mysteries of a human disease and provide important insights for its treatment. Nowadays, this gold standard of studying single genetic disorders has been multiplied and sped up on an unprecedented scale. There are now numerous projects that are aimed at sequencing the DNA of many individuals with different diseases and using the power of bioinformatics to analyse how genetic variation might lay at the foundations for previously poorly understood diseases. Ensembl Genomes 31 has been released! 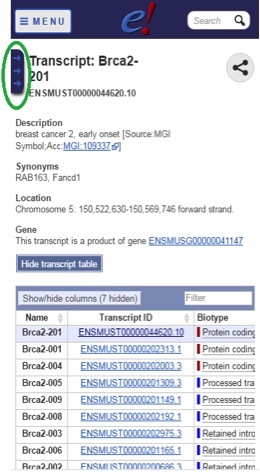 29th March 2016 by Ben (Outreach)·Comments Off on Ensembl Genomes 31 has been released! 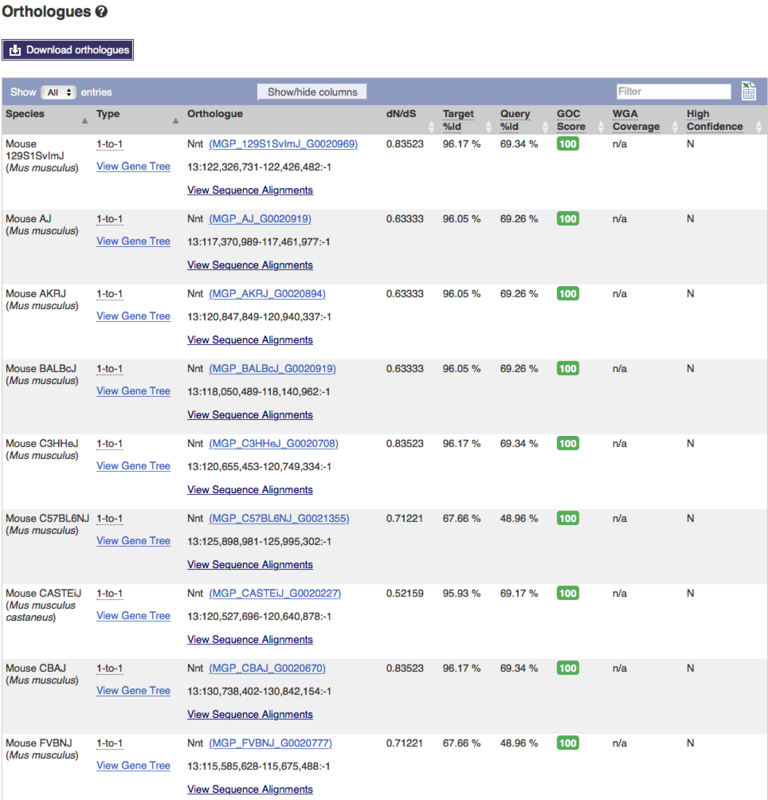 What’s new in Ensembl Genomes 31? There are legs and tentacles everywhere in this release of Ensembl Metazoa, as ten new species scuttle, swim and slither into our databases. From the Antarctic midge to the California two-spot octopus, the new species illustrate the diversity of metazoa. Our new Metazoan species also include dog and rat parasites (the itch mite and a nematode), as well as species that pose significant problems for agriculture (Australian sheep blowfly) and aquaculture (the salmon louse and a myxosporean). The common bumblebee is an important pollinator, a brachiopod represents a new phylum in Ensembl Metazoa, while the African social velvet spider is a fascinating model of sociality and is the first spider in Ensembl Genomes. Not to be outdone, Ensembl Protists is now updated to 158 genomes from 104 species and Ensembl Bacteria has been updated to include the latest versions of 39,584 genomes (39,183 bacteria and 401 archaea) from the INSDC archives. Fungi: Updated annotations based on PHI-base 4.0 have been included. New variation data for Schizosaccharomyces pombe. Protists: Addition of 4 protist species for pan-taxonomic comparative analysis (Monosiga brevicollis, Thecamonas trahens, Cryptomonas paramecium and Chondrus crispus), meaning that Ensembl Compara now includes protists from all the major Eukaryotic clades. Plants: There are now 350,000 new rice variations across 3,000 rice accessions from 89 different countries as well as track hubs for more than 900 public RNA-Seq studies, totalling more than 16,000 tracks across 35 different plant species. Metazoa: Updated gene sets for the leaf cutter ant, red fire ant and the two-spotted spider mite as well as updated gene sets from VectorBase and WormBase. Check out all the changes on our Ensembl Genomes website. Ensembl 84 has been released! This data can be viewed alongside other tracks in Ensembl by using the ‘Configure this Page’ option and selecting your cells of interest. You are now able to calculate linkage disequilibrium (LD) between any two variants in Ensembl. To calculate the r2 and D’ values for LD between two specific variants, enter the ID of any variant into the LD calculation text box on the specific page of the reference variant. This feature can be found by clicking on ‘Linkage Disequilibrium’ from the menu on any variant page. 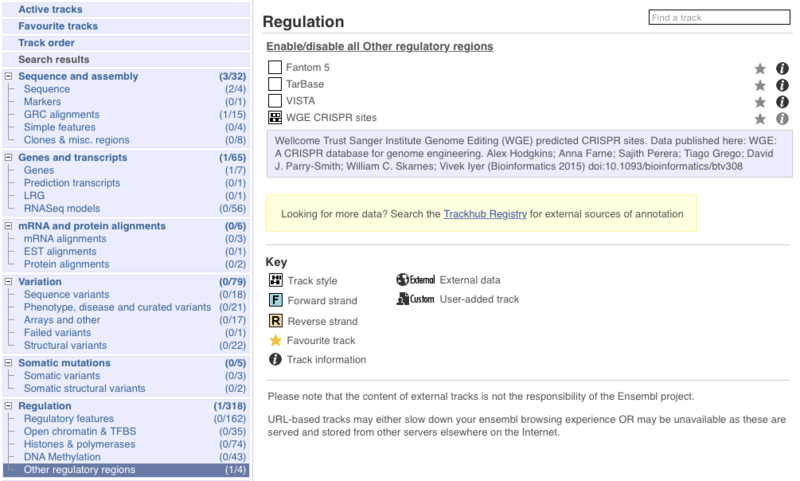 With the arrival of the new Track Hub Registry, we have added a feature that allows you to search for track hubs of interest and attach them directly to Ensembl. Just click on the ‘Add your data/Manage your data’ button on any Ensembl page, and select ‘Track Hub Registry Search’ from the lefthand menu. The interface will only search for hubs that have assemblies available for the site you are on; to see the full range of species and assemblies, visit the Track Hub Registry site directly. 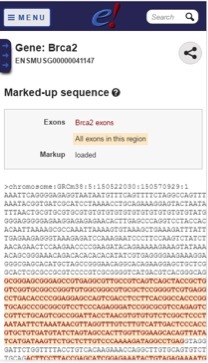 The transcript haplotype view is a new data view we have implemented that allows you to explore observed transcript sequences that results from variants identified from resequencing data from the 1000 Genomes Project. By clicking on the ‘Haplotypes’ link on any transcript page, you are able to view protein consequences, population frequencies and protein alignments of all the haplotypes for that particular transcript. Ensembl Families now defined by an HMM library, based upon the Panther database. Find out more about the new release, and ask the team questions, in our free webinar. Wednesday 16th March, 4pm GMT. Register here.